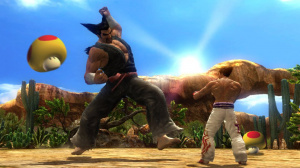 Tekken series producer Katsuhiro Harada has spoken to Siliconera about the upcoming Tekken Tag Tournament 2, and briefly discussed what it's like working with Nintendo on the Wii U version. Siliconera: Back at Nintendo’s press conference we saw the Mega Mushroom as an item that made Heihachi gigantic in Tekken Tag Tournament 2 for Wii U. That was pretty interesting! What else can you tell us about the Wii U version? Katsuhiro Harada: Well, it is kind difficult to mention much because we are focusing on the Xbox 360 and the PS3 versions as the PR focus. But we can say this – because we are collaborating with Nintendo we really wanted to create features like [the Mega Mushroom] that are only possible because we are collaborating with Nintendo. That’s just one example and we hope that everyone will be looking forward to the other things we have to show. "Katsuhiro Harada: Well, it is kind difficult to mention much because we are focusing on the Xbox 360 and the PS3 versions as the PR focus"
That's the problem Nintendo are going to face with multi platform wii u games and third parties, they are going to focus on and advertise the 360 and ps3 versions. @MariosLoveChild That's because of release dates, not other things. I know what you mean. Despite Nintendo now having a console capable of handling multi-platform titles, I am afraid that the mindset of Nintendo having a lesser console will still exist and developers/publishers will continue to push the other platforms. It could be a short-term problem due to the Wii U not being out yet, as @Araknie suggests, but I am personally not confident of that. Lets hope it doesn't turn out like the fun-but limited 3D Prime Edition. Including fan service like that is great and will make me more liklely to buy the game. I hope there's quite a lot of it and not just the Mega Mushroom along with two more items or something. It was a problem in the GameCube days too. You should be ashamed of those puns. Not to sound like a jerk, but it only makes sense to push 360 and PS3 version More. Fighting games sell a lot better on those systems. It's like Namco already knows the Wii U version won't sell that well unless they throw in Nintendo exclusive stuff. I am just glad Tekken is on a Nintendo system. It sounds awesome that they use not only the power of the console but also the history of the company. Similar to Link in Soul Calibur II on the Gamecube (vs Spawn on the Xbox version that made no sense at all), it will be cool to see how they take advantage of that. Sounds cool and all, but considering all of my friends that are getting this are getting it for the 360, there's no chance of me getting this on WiiU. Fire Flower.....god that will be amazing. I'm a fellow Tekken fan; but only have played the 3DS Tekken Prime Edition! However I love the Tekken movie; I guess I'll be the fist to admit it... because I love the characters Jin & Yoshimitsu! But Tekken Tag Tournament 2 is indeed one of the only 3rd party titles I'd get for the Wii U; because I love fighting games! And I love that the Wii U version will have Nintendo stuff in it; I like the MEGA mushroom for sure! 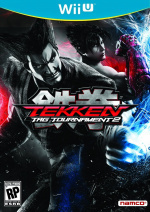 I think that I am one of the few people out there that has never played a Tekken game before. This wasn't on my radar before but after watching a gameplay video of the 360 version on YouTube I am strongly considering picking this up. If I do get it then I am going to pick it up for the Wii U. I just hope that the Wii U version is at least as good as the 360 and PS3 versions. I'm hoping for some really cool Nintendo-related features in this game.